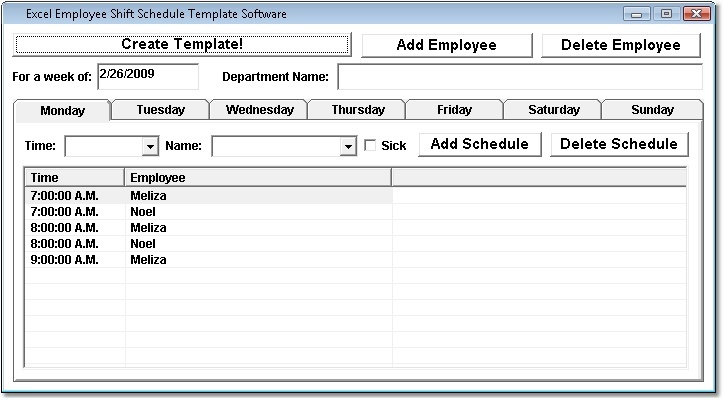 Excel Employee Shift Schedule Template Software help you Create employee shift schedules templates in MS Excel. Excel 2000 or higher required.It saves you headaches and time by allowing you to simply specify your daily shifts and then assign them to up to 25 people using drop-down menus of available shifts.Shifts are removed from the menu as they are assigned and when the menu is empty you are done for the day. It forother applications available. ...... The program keeps track of shifts for 3 different groups of employees and was created to schedule nurses, but can be used to schedule anyone to daily shifts. Up to 10 vacation periods for each employee can be entered in the vacation table and you are prevented from assigning shifts to employees who are on vacation. Outputs include individual and team schedules, an employee hours summary and a file that you can import into your Outlook Calendar, PDA or Smart Phone so your schedules will always be available for easy reference. The Excel spreadsheets are available in sizes to schedule 25, 50 and 100 employees and can be downloaded from our website and used on a free trial basis for evaluation. Other easy-to-use spreadsheets to schedule your people to daily tasks or daily hours are also available. Qweas is providing links to Employee Shift Scheduler for Excel 7.0 as a courtesy, and makes no representations regarding Employee Shift Scheduler for Excel or any other applications or any information related thereto. Any questions, complaints or claims regarding this application Employee Shift Scheduler for Excel 7.0 must be directed to the appropriate software vendor. You may click the publisher link of Employee Shift Scheduler for Excel on the top of this page to get more details about the vendor.